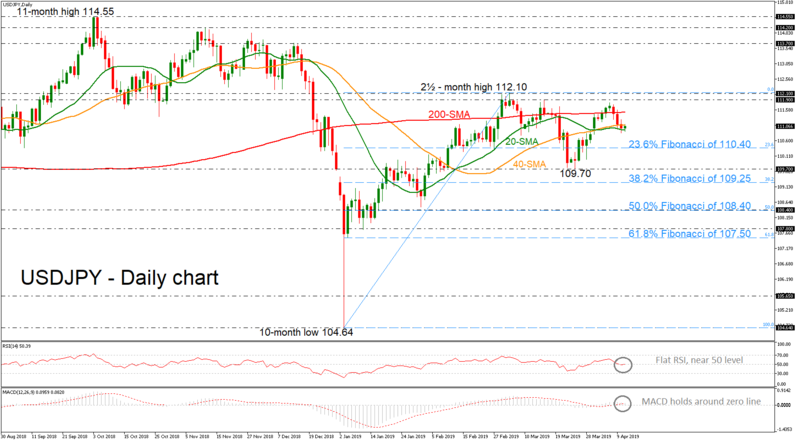 USDJPY is trading near the psychological level of 111.00 and is capped by the 40-day simple moving average (SMA). The sell-off in the preceding days drove the price well above the flat 200-day SMA indicating a possible bearish retracement in the short-term. The momentum indicators, the RSI and the MACD, are moving sideways near the 50 level and around the zero line respectively. Should the pair continue the bearish pressure and slip beneath the 20-day SMA, it could move towards the 23.6% Fibonacci retracement level of the upleg from 104.64 to 112.10, near 110.40. Another leg lower could shift the attention south until the 109.70 support and the 38.2% Fibonacci of 109.25. On the upside, in case of a successful jump above the 200-day SMA, immediate resistance could be faced near the 111.90 – 112.10 resistance area, which encapsulates the two-and-a-half-month highs, where it topped in the preceding month. An aggressive buying interest above these lines could confirm the recent bullish attitude of the last three months, extending gains towards the 113.70 region, reached on December 2018. Overall, in the medium-term picture, the three-month view remains slightly bullish, however investors should wait for a daily close above 112.10 for positive actions.